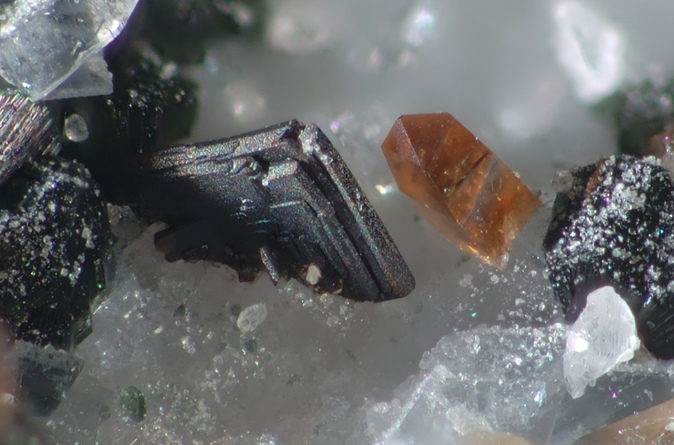 Allanite: Mineral information, data and localities. Named in 1810 by Thomas Thomson for Thomas Allan (1777-1833), Scottish mineralogist, who first observed the mineral. Individual REE members were later distinguished by adding the -(Ce), -(La) etc. suffix. Fe-rich varieties may be confused with ferriallanite-(Ce) and Ferriallanite-(La), or other blackish members of the epidote supergroup. In the older literature the name "orthite" was often used instead of allanite. Visit gemdat.org for gemological information about Allanite. Thomson, T. (1810) Experiments on allanite, a new mineral from Greenland. Transactions of the Royal Society of Edinburgh: 8: 371-386. Hasegawa, S. (1958) Chemical studies of allanites from the new localities in Fukushima and Kagawa prefectures. Science Reports, Tohoku University, Ser. 3, Mineralogy, Petrology, and Economic Geology, 6, 39-56. Hasegawa, S. (1960) Chemical composition of allanite. Sci. Report of Tohoku University, Thuird series: 6: 331-387. Frondel, J.W. (1964) Variation in some rare earths in allanite. American Mineralogist: 49: 1159-1177. Dollase, W.A. (1971) Refinement of the crystal structures of epidote, allanite and hancockite. American Mineralogist: 56: 447-464. Pavelescu, L., Pavelescu, M. (1972) Study of some alanites and monazites from the South Carpathians (Romania). 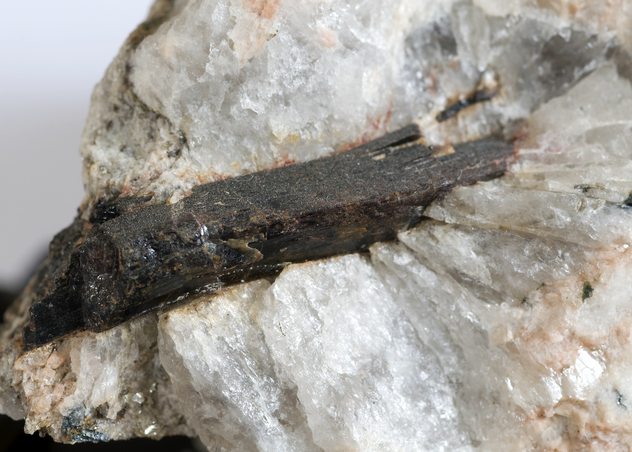 Tschermaks Mineralogische und Petrographische Mitteilungen: 17: 208-214. Chesner, C.A., Ettlinger, A.D. (1989) Composition of volcanic allanite from the Toba Tuffs, Sumatra, Indonesia. American Mineralogist: 74: 750-758. Sorensen, S.S. (1991) Petrogenic significance of zoned allanite in garnet amphibolites from a paleo-subduction zone: Catalina Schist, southern California. American Mineralogist: 76: 589-601. Peterson, R.C., MacFarlane, D.B. (1993) The rare-earth-element chemistry of allanite from the Grenville Province. Canadian Mineralogist: 31: 159-166. Bonazzi, P., Menchetti, S. (1994) Structural variations induced by heat treatment in allanite and REE-bearing piemontite. American Mineralogist: 79: 1176-1184. Catlos, E.J., Sorensen, S.S., Harrison, T.M. (2000) Th-Pb ion-microprobe dating of allanite. American Mineralogist: 85: 633-648. Ercit, T.S. (2002) The mess that is “allanite”. The Canadian Mineralogist, 40, 1411-1419. Poitrasson, F. (2002) In situ investigations of allanite hydrothermal alteration: examples from calc-alkaline and anorogenic granites of Corsica (southeast France). 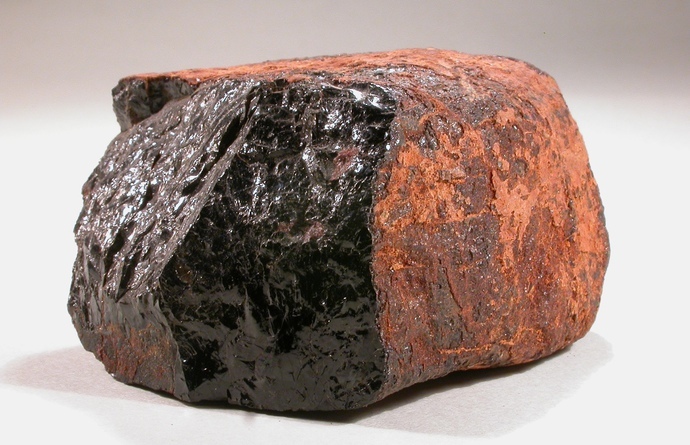 Contributions to Mineralogy and Petrology: 142: 485-500. Smith, M.P., Henderson, P., Jeffries, T. (2002) The formation and alteration of allanite in skarn from the Beinn an Dubhaich granite aureole, Skye. European Journal of Mineralogy: 14: 471-486. Gieré, R., Sorensen, S.S. (2004) Allanite and other REE-rich epidote-group minerals. In: Epidotes (A. Liebscher & G. Franz, editors). Reviews in Mineralogy and Geochemistry: 56: 431-493. Hoshino, M., Kimata, M., Nishida, N., Kyono, A., Shimizu, M., Takizawa, S. (2005) The chemistry of allanite from the Daibosatsu Pass, Yamanashi, Japan. Mineralogical Magazine: 69: 403-423. Hoshino, M., Kimata, M., Shimizu, M., Nishida, N., Fujiwara, T. (2006) Allanite-(Ce) in granitic rocks from Japan: genetic implications of patterns of REE and Mn enrichment. The Canadian Mineralogist: 44(1): 45-62. Hugh S. Spence (1930) A REMARKABLE OCCURRENCE OF THUCHOLITE AND OIL IN A	PEGMATITE DYKE, PARRY SOUND DISTRICT, ONTARIO. The American Mineralogist, 15, No. 11, 499-520.